Recorder by Laurent Jeanneau (King Gong) in Touay/Phaosampham in the district of Pathoumphone (province of Champasak, Laos) in February 2006. Champasac is the southern province of Laos, bordering Cambodia and Thailand. For centuries it was a small Lao Kingdom. 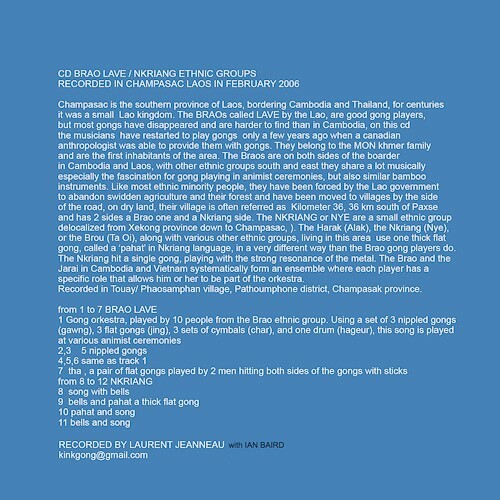 The Brao - called Lave by the Lao - are good gong players but most gongs have disappeared and are harder to find in Cambodia. 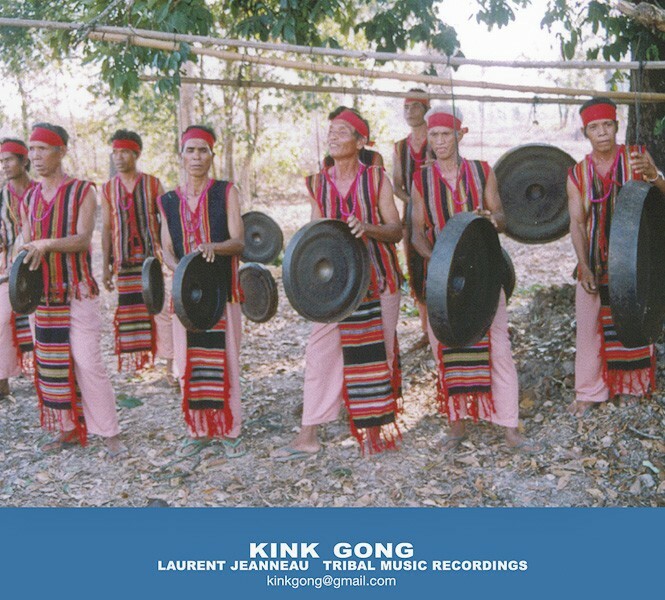 On this cd, the musicians have restarted to play gongs only a few years ago when a Canadian anthropologist was able to provide them with gongs. They belong to the Mon-khmer family and are the first inhabitants of the area. Like most ethnic 'minority' group, they have been forced by the Lao government to abandon swidden agriculture and their forest and have been moved to villages by the side or the road, on dry land, their village being refered by the mile stone on the road side, like Kilometer 36 for a village being 36 km south of Paxse. This specific village as two sides: a Brao one and a Nkriang one. The Nkryang - also called Nye - are a small ethnic group delocalized fromXekong province down to Champasac. The Harak (Alak), the Nkriang (Nye) or the Brou (Ta Oi), along with various ethnic group in this area use one thick flat gong called "pahat" in nkriang language, in a very different way the Brao gong plyers do. The Nrkiang hit a single gong, playing with the resonance of the metal. The Brao and the Jaraï in Cambodia and Vietnam systematically from an ensemble where each player has a specific role that allows him or her to be part of the orkestra.